Project management is a complex of actions taken to successfully deliver a process and achieve desired results. The activities of project management encompass planning and allocating resources, controlling the resources and optimizing the organization of resources in the best way to achieve set goals and get needed results. A project is a process of actions with certain resources aiming at production of a specific product or service. A project features specifically set time limits. Proper project management ensures delivery of the project on time without any delays or fails to perform the actions properly which can result in breaking the deadlines. Successful project delivery needs specific skills and perfect management strategies. The greatest challenge for any project started at any company is achieving all the set goals and delivering every step of the project on time. Unfortunately 93% of fails to deliver a project are the results of human factor related mistakes. Before getting started to initiate and deliver any project, you should understand distinctly the key steps of project management. The result of project initiation will be clear charts depicting the goals and the means to achieve the set goals. Using proper project management systems and tools you can be sure that every participant of the project clearly understands his or her mission in the project. Project planning is the next step of project performance. On this step time, costs, human resources, internal and external resources are planned as well as factors affecting every step of the project are considered. Risks should be properly evaluated and all the measures should be taken and considered to minimize the effect of the possible risks on the project performance. Poor planning will result in fails. Plans in project management are essential to set the scope of tasks for every team and participant engaged in the project. Project executing is one of the biggest parts of project management. On this step a project teams exactly follows the plans. This step of project management involves strict control of every step and task delivered using the planned resources. If the overuse of resources is noticed, then a project manager should turn a step back tp project planning and revise the resources. Project control is one of the final steps of the project management. When the project is almost over the team should track the results during a certain period of time to understand whether all goals and tasks are achieved and all the needs of business for which the project has been executed are satisfied. This can happen that a successfully delivered project will result in dissatisfaction of business. If this happens project management team should revise the process and find possible mistakes. If the project is executed without proper project management then it is almost impossible to detect possible mistakes. Project closing is the final step of project management. A project an be closed only when all the goals and results are achieved. All the activities can be finalized only if the goals are met. Commonly it takes some time to get sure that all the business needs are satisfied with the project. As soon as we start talking about selecting a PM tool, we mean the software that is able to do everything for us and that can work any place in the world where the Internet is present. Some people say that such kind of solution is just a hoax. This fact is not true anymore because the abundance of such solution is impressive and any project manager can choose a tool to their taste. The dream of most project managers is to have a universal solution which is all in one, that is cloud-based one and with the possibility to access it via mobile gadgets i.e. smarphones or Androids. If we speak about the existing examples of such tools, we can name Comindware Project that seems to correspond to all the wished features. The tool is cloud-based one, making it possible to access it everywhere and any time of the day. Besides, it offers mobiles versions for iPhone and Android, making the software more attractive to potential users. As soon as we speak about the online collaboration features, we can claim that product developers have done their best by introducing a range of options that lead to full integration with the company workflow process. 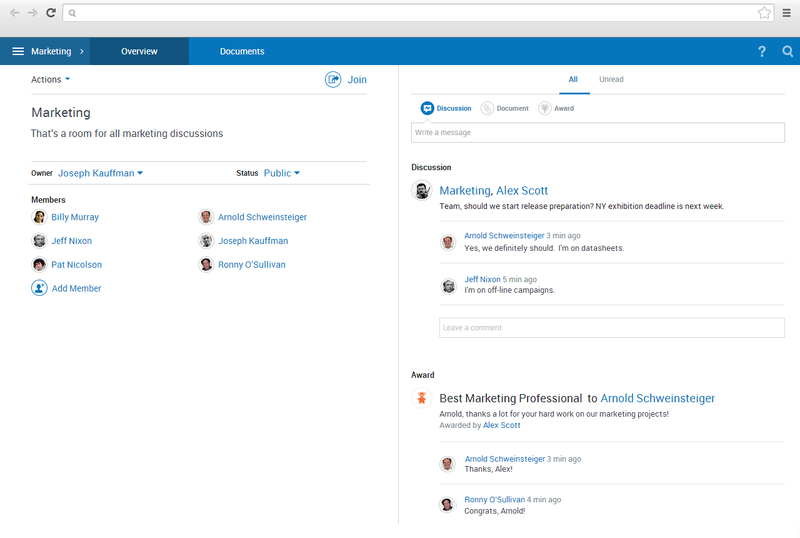 For example, Comindware Project offers to keep all the project discussion in one place even when the project is not finished. Such way of cooperation is accompanied by the traditional email writing and document sharing. Comindware Project also allows creating special discussion room or chat rooms where you are able to analyze certain specific topics while working. You are likely to invite all other stakeholders of the project to the discussion. This solution helps teams to manage all the project documents in one place: price lists, agreements, press releases etc. In case you are in need of a particular person involved in the project, you will use the powerful social Directory and visual Orgchart to trace the person you need, their tasks and location, contact data etc. The software makes it possible to motive or boost all the developers by recording their achievements. Thus, at the end of the project you can make a final decision about the project results and offer a bonus to the most hard-working developers. To sum it up, Comindware Project is thought to grow entirely into the project and company workflow becoming its inseparable part. Thus, next time when a company project manager complains about the inability to get a rather flexible PM tool, recommend to search the Internet in a better way and they will be lucky to discover many marvelous tools and Comindware Project can be one of them. A person usually has many talents, and, from time to time, they implement their talents in everyday life. But, when you are a project manager, you have to gather together your each skills and apply them to your current project. Even in spite of being a super talented PM, you are likely to face some complications or difficulties while accomplishing a project. Here is the list of the most typical hardships that a project manager is likely to encounter. - Poor communication with clients can make the whole work unbearable. In most cases, clients give rather vague and uncertain ideas about their vision of the project, and the task of a PM is to clarify every moment of a project. Very close and thorough interaction with a client is the definition of success at the end of the project. - Not meeting the deadline is one more difficulty that a project manager has. Any project is made up of hundreds tasks, each of them having a deadline. The best way is to reach deadlines. If it is hard for you to follow all of them, refer to project manager software that has been designed to help you in such cases. - Managing every project the same way is not a perfect solution at all. Every project is like a newly born child that requires special attention and care, separate deadlines and tasks, and even a team that will carry it. - When you start a new project, the right decision will be to select only those professionals you rely one. You have a chance to choose the people for your project that are likely to complete it successfully. While delegating tasks to team members make sure that you assign tasks to the right people. - Do not manage several projects at the same time. Having one or two of them is OK, but if the number goes up, you will not definitely be able to cope with them all in the proper way. These are the most usually or typical troubles that a project manager can face with: not enough communication with clients; missing the deadlines; managing every project the same way; not choosing the right team; having too many projects at the same time. It does not matter if you are an experienced project manager or a fresher, you had better pay attention to these issues, as they are likely to save your project and make it successful. There is a great deal of online marketers and SEO specialists are not aware of the Internet community Blog Engage. It is a real pity because it is one of the cutting–edge blogging communities where bloggers all over the world are able to post their articles and share the experience in various spheres of live and work. What makes this blogging community one of the most popular and progressive ones? Blog Engage is the online community where a blog is the centre of attention. If you are eager to make your blog popular and visible on the Internet, you should join the community. Blog Engage helps you communicate with enthusiastic bloggers from all over the world by posting your articles and getting votes for them. If your post gets the maximum votes, it becomes featured or special and you earn certain credit as a top blogger or participant. You are able to get into touch with the bloggers who are experienced ones or young bloggers who only start their career. Thus, your make more contacts and help your business promotion. By entering the blog community you will have lots of visits to your blog or site, thus expanding the blogging community of your own creation via Blog Engage. When we speak about promotion, you can say that Blog Engine is a great place to get back links and Adsense profits. The page rank of the blog is high allowing you to upgrade the page rank of your own blog. You are also likely to get the targeted traffic from Blog Engage. At the same time a lot of SEO and promotion materials and books are available to you 24 hours a day, answering all your questions about promotion and site optimization. Blog Engage is the place where you can enjoy various topics of discussion and everybody is sure to find some themes to their taste. Blog Engage offers various plans to join it depending on the type of user. You can choose any plan that is closer to you and your abilities. In case you have no idea what to choose, Standard pack is the right thing. After paying about £20 for lifetime membership, you can enjoy all the blog benefits. 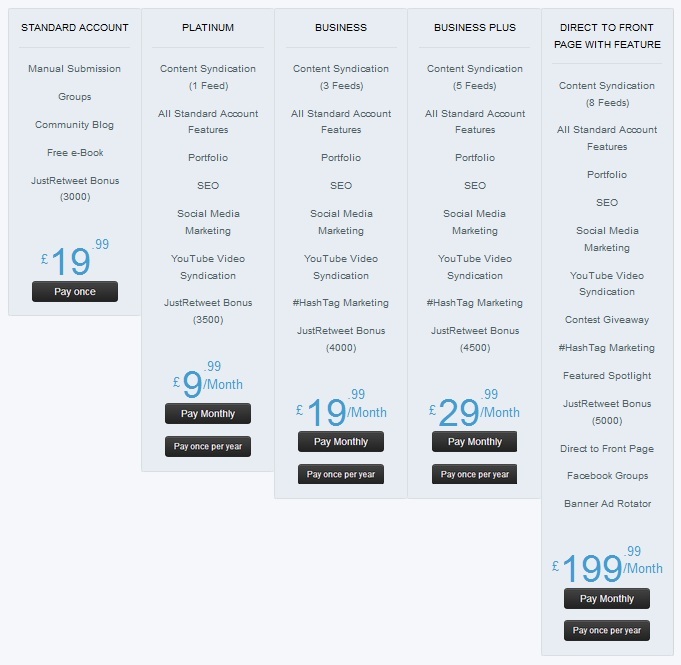 As soon as you want a serious SEO support and promotion there is a Platinum plan with a great number of options for promotion on the Internet via Facebook, Twitter, YouTube etc. Looks attractive and tempting? Then, do not hesitate and join the community Blog Engage as soon as you can do it. The only thing you should do it to write a post and send it for the review. Join Blog Engage for free and become the part of the world bloggers community. There is a general statement that people like to stay where they are and hate changes. And this statement is repeated so often that almost everybody believes that it’s an absolute truth. People resist to change their everyday routine but become even more dubious when speaking about professional activity. And it comes to a trade-off between this resistance to any change and the growing consumer demand for new goods and services especially in the IT sphere. So, what are the reasons for this? Do we face a belief that appear at the genetic level? Or is it a conclusion based on the previous bad experiences of improper change management? So, which of this two should be addressed if we need to improve the situation? I don’t suggest to choose between personnel training and good change management policy. I believe that every company and enterprise need to implement the best practices of a change management including clear and unambiguous processes, proper communication in advance and so on. We need to prepare our people, give them good instructions and be honest while answering questions. Don’t forget about motivation and explaining the goals and benefits. But how to prepare yourself? My two cents include two advices – be ready for other people’s emotions and track the change process as much as possible. Why? Here are some thoughts from my experience. As a manager you will decrease the resistance a lot if you provide the answers to difficult questions in advance. When people face the uncertainty and lack of information they don’t want to enter the “land of changes”. They start screaming, resisting and creating the other problems that result in lower efficiency. Conflict avoidance never was a good change management strategy in a long-run period. 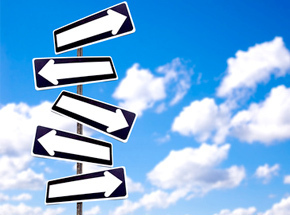 So, my first advice: good PM not just creates a road-map but share it with his/her people. And my second mentioned above advice is to control the change as much as possible. Be informed immediately when something goes not the way you plan. Get alerts to make fast decisions. And when everything goes good than track the project progress and show it to your people. Why? It will increase the sense of confidence and decrease the resistance to changes. When people see the progress they are more likely to help this progress as they feel to be the part of it. And this is also very effective way to overcome the resistance. And how do you help your people not to hate changes? A lot of people are waiting for Cyber Week Shopping the whole year. We delay to buy electronics and clothes, we don’t buy toys and accessories and wait for the time when the price will be 50%-80% lower. So, this time is coming very soon. But as professional project managers we have an interesting choice – to use or not to use the project management knowledge to get the most from this week. And most of all I mean the planning skills. And we need to decide fast to have enough time to do everything. Most of the people google for the shopping stuff in 10 minutes before the end of the Cyber Week. This is the main reason why many people don’t get what they really want. So, as a project manager you may use your skills to plan your shopping strategy. What exactly you need to do is to create make a list of the online retailers with the links to the products. Setting priorities will be very helpful as well. Create a list using your task management soultion. There are two types of things one plans to buy: the things that we really need and the things that we want to have. If you are a rational person you understand that you can’t get everything you want. But Cyber Week is also a miracle time when prices are being cut dramatically. You need to have the “holiday wishes” in your wish list but with lower priority. Also don’t just plan to buy things for yourself but gifts you could actually give to your friends, parents or other nice people in your life. The issue is that retailers spread the information about their discounts and promotions differently. Some limited discounts are distributed through social networks – Twitter or Facebook or even YouTube. You need to set the alerts to be informed about the new publications from your favorite retailers. Add something useless and funny for yourself or your family. Choose something extraordinary to get it for less than a half of a price. Do a surprise as people like to be surprised – so, plan to buy something additional, something not from your initial list. And good luck to have the best Cyber Week this year! Modern world experiences the demand for a lot of various tools, as all the business processes are getting more and more complicated to be run by a single person. Therefore, a great deal of executives choose “clever” solutions to get some assistance and to simplify the business process management. 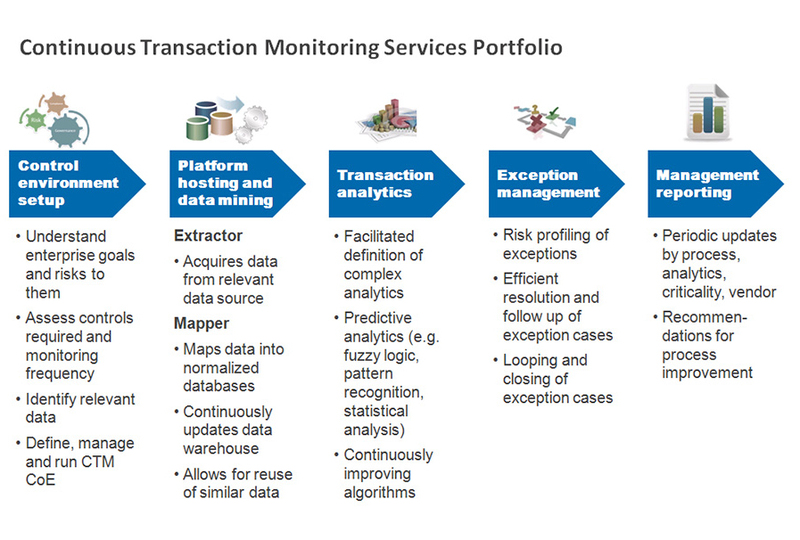 Transaction monitoring has just become very crucial in companies. Firms usually have been more concerned about website monitoring, and they have tried to acquire the solutions to see how effective their sites work. Such tools are aimed at detecting any possible troubles in site operating. But, at the same time, there are so many additional applications that function on your site, which deserve special attention from the side of monitoring software. Such web applications have been designed to reach a certain aim. The examples of such apps are login in a site, log out, and sign up and so on. In such a way, webmasters have made up their mind to start transaction monitoring. There is a variety of tools, which are particularly good at transaction monitoring. It is so hard to decide upon one of them because they present the same type of services on the market. One of the latest solutions is Anturis. Anturis has been developed to provide a high level of security and stability of every transaction procedure on the site. We can say that Anturis is unique software that is able to simulate a real time user and test every transaction needed. Besides, the software combines many of demanded features like website and server, databases, transactions monitoring. Clients usually prefer all in one pack which gives a full control of the system. In spite of being rather complicated and multifunctional, Anturis is easy to use, because of the cloud-based location which allows you to make the tool work any time of the day. In case of any trouble detected you have SMS, email and voice alerts. Maintaining a site is both easy and hard. On the one hand, you have a tool which controls how the site works, but on the other hand, there are so many minor, but important processes that need monitoring. Thus, transaction monitoring tools are of great help. Being a professional means striving for excellence in your field and keeping up with all new trends and developments in your industry of interest, and professional certification is one of the ways of being competitive in a constantly changing marketplace. In this article we are going to talk about how professional certification can help people build up their careers and why it’s so important for both employers and employees. It’s a wide known fact that certification does not only help to evaluate employees correctly, but it also provides motivation boost and improves company quality standards. And for those employers who want to raise company’s productivity by constantly improving employee’s skills and need some sort of solid criteria for employee promotion, professional certification is a great way to start. One of the best and most rational ways for a company to implement employee certification is using specialized software that could track professional certification process. One of the most convenient solutions for this purpose is Comindware Tracker. It’s fully customizable which enables adding approval or assessment steps to make the process reflect each company’s specific business policies. The solution helps uniting the main steps of employee certification tracking, including certification request, supervisor approval, training, testing and retesting, making it easier for managers to track the process and get the best results possible from personnel. Whether personnel managers need to teach employees how to work with new equipment or software or they just need to improve quality of services, workflow solution allows setting up and controlling the process without having to check on every single step employers make. Whatever the purpose of training or certification is, carefully set up workflow will not only allow managers to control process better, it will also bring the group of employees together through common experience, since they will be able to go through the process of certification as a team. That aspect is especially important for the companies where ability to cooperate in team is crucial. Thus, employee certification policy can help to build the team of well-trained professionals who will be willing to collaborate and constantly improve their skills and knowledge. But what’s in it for me as an employee, you may ask? The thing is that professional certification shows your employers and your clients that you are not only qualified to do your job and your knowledge is up-to-date, but it also indicates that you are committed enough to your profession to invest your time in further training. Professional certification gives your clients confidence in your abilities and it gives you that extra edge that you might need while applying for a promotion. As you can see, as an employee you benefit from professional certification by having an advantage over candidates who didn’t go through certification process and by earning higher wages thanks to your up-to-date skills and knowledge. And if you are an employer who wants to hire a specialist professional certificate will help you to make sure that the candidate has enough knowledge and experience to deal with any work-related challenges that might occur. Being a constantly growing business trend, BYOD, or bring your own device, has a lot of people talking and discussing all the pros and cons of having this concept implemented. Since it’s always a good idea to be aware of the newest business trends, today we are going to learn the basics of BYOD. The whole thing with bringing your own device was sparkled with the fact that in era of cutting edge technologies it usually happens that users get their hands on the newest gadgets and devices faster than a lot of companies. And if these devices are so easy to use and save quite a lot of time, why not take them to work? 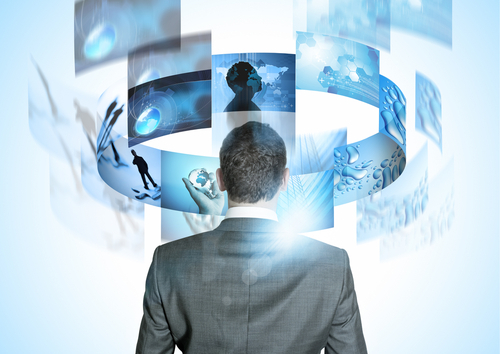 And thus BYOD has become largely embraced concept in a modern day business. 1. BYOD helps you save money. How so? You not only reduce employee training time, but your employees also pay the full cost of the hardware and other expenses. You would think that the employees wouldn’t be that happy with that, but statistics says that BYOD approach actually leads to worker satisfaction. People can use the devices they are comfortable to use, the ones they are familiar with. 2. You get access to the most cutting edge devices on the market and the most skillful employees. Companies that embraced BYOD get all the benefits of the most progressive capabilities the latest devices have to offer, since nowadays users buy upgraded devices more frequently than most companies have ability to. Plus, BYOD gives you so much needed competitive advantage over other businesses since it helps attracting best performers who seek work flexibility. 3. Your IT team can concentrate on more important tasks. Since employees are responsible for maintaining their own devices, IT department get an opportunity to focus on other things than constantly dealing with device management and support. 5. Without proper software, BYOD can become one of the risk factors for your company. The thing is that employee’s devices are used in ways that devices owned by companies aren’t, which means the risk of stolen or destroyed data is increasing. That’s why a company should think of getting an effective backup and restore solution even before considering embracing BYOD trend. As you can see, BYOD approach can be quite beneficial for companies in case all the advantages and disadvantages are taken into consideration and well thought out. Project managers all over the world just dream to make every project turn out to be successful and beneficial. But reality appears to be different, and some of the projects fail and the others happen to have bugs and faults. What really makes a project successful? How to reach the desired results with less pain? The main condition of success is effective project management, which is ideally achieved after certain years of active work or experience. But, at the same time, lots of “new comers” strive to complete their projects quickly and cheaply as well. The first thing that every PM should take into consideration is planning. The planning stage should not be ignored, as it will, for sure, help to reduce costs of the project, will increase the quality of the product done. The plan is to be approved by all stakeholders, and, thus, in the future, you will have the stable base of the whole work. In order to ease the planning stage, you can implement numerous task management tools or project management software, which is present in your office for sure. Such solutions give you a hand while calculating the costs of the project, its duration, approaches, potential risks, and doers of the project and so on. The next stage will include creating a detailed work plan for any participant of the project. Having such a plan will simplify the work of a PM thousands times. After setting up a scrupulous working plan, the team starts the project, and right now the main goal of a project manager is to examine the way the plan works and how the project is realized in fact. A PM has to follow the discussed plan, thus avoiding potential bugs and faults. Surely, emergency situations can occur, but if they were outlined during the planning stage, they are unlikely to happen at all. While monitoring the project phases, do not forget about the budget expenses, as they should be within the budget limit. A project manager should pay special attention to all warning signals that take place during the work, as they can suddenly turn into a disaster, which is likely to ruin the whole project. Nothing should be left unattended in this kind of work. Try to follow a simple rule to solve issues as soon as they come. Do not let them stay unsolved for some time. You will never predict the possible results of the open issue. One more thing that really helps to reach success is communication, which is able to solve any problem or trouble. The more PM talks to the stakeholders, the team, the more chances they have to complete the project successfully. The tips given here are a bit universal, but they deserve certain attention and thought. Every project manager, who is in profession for a long time, can easily predict and foresee possible troubles in order to have a project without any faults.